It’s been more than a week climbers have completed acclimatization and waiting for weather window to launch summit push. The window from July 20 to July 25 was thought to be a weather window by many teams, but hot temperature and rain on higher camps halted the progress. Rain and hot temperature makes the snow very soft, thus increases avalanche danger and terrain becomes dangerous for climbing. Few teams were running short of time (some of them had permits up to July 30th) and few climbers were sick of this waiting game, they wanted to seize this window and started summit push. 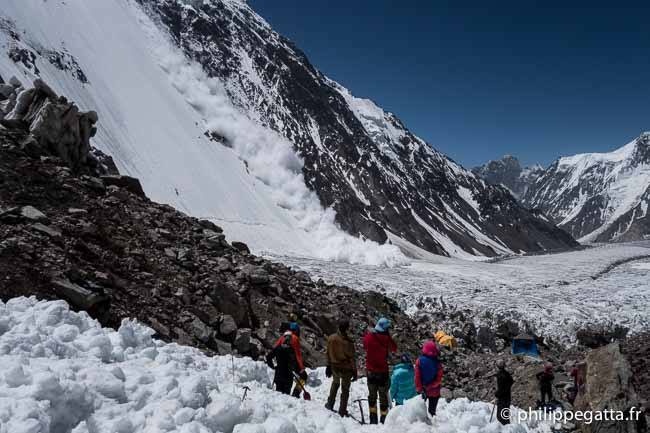 An avalanche was triggered from camp 1 of Broad Peak and seven climbers were swept by the avalanche, one Pakistani high altitude porter names Qumber lost his life in the avalanche, a lady from Japan was badly injured with open broken ankle and dislocated shoulder, she was heli evacuated after two days. 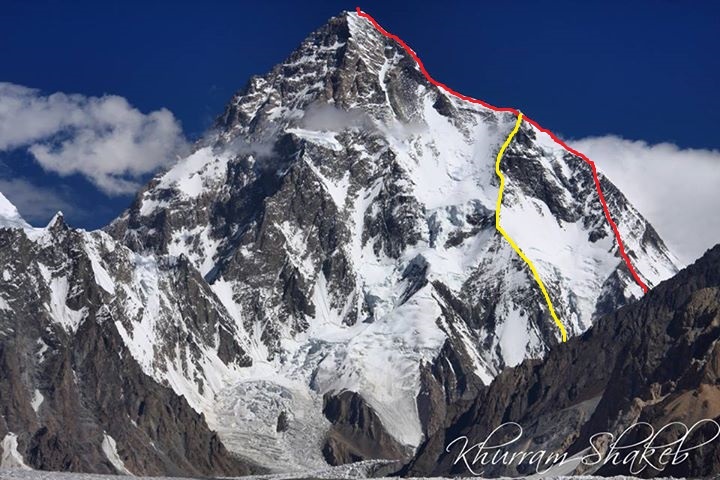 This incident warned teams on K2 and other 8000ers to stay put and let the mountains dump snow naturally. Swiss team lead by Mike Horn waited for couple of days and announced summit push; Spanish climber Carlos Suarez, Argentinean climber Galvan and one Czech climber went with Swiss team on Cessen route increasing the possibility of fixing ropes under bottleneck. They reached Camp 3 7000 meters on July 23rd and spent a night there; on July 24th early morning they started push went up to 7138 meters and started to descend down due to waist deep snow and high altitude winds. Mike Horn ended expedition after reaching base camp on same day and they are heading back home. 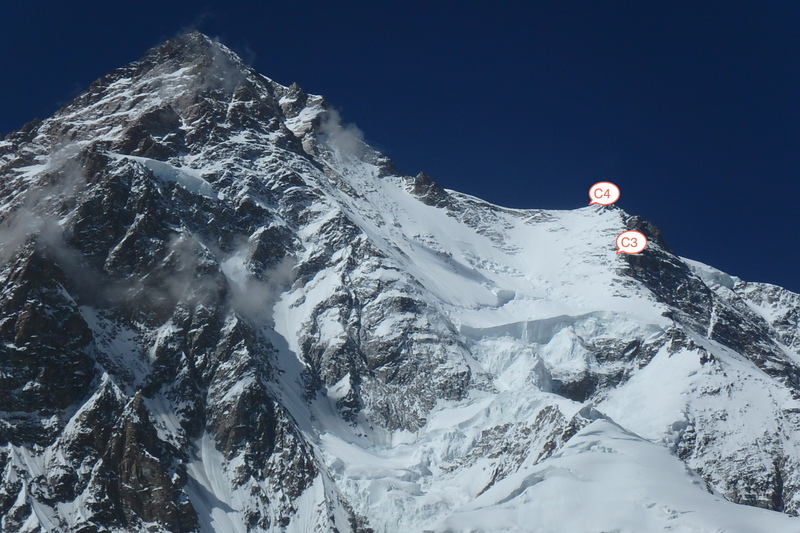 image shows progress of Swiss team on K2 Cessen route. Hungarian duo ended expedition after return of Swiss team, although I was told by a Pakistani porter that Hungarians were planning to quit since couple of days ago and they had asked few climbers to bring down their equipment from higher camps. A member of Himalayan Experience Bo Parfit has already gone home because he was missing his new born child. Alec Turner was also about to leave but after discussion with team, he choose to stay and give it a try. Seven Summits is a large team with sixteen climbers including sherpas. Seven Summits started summit push on July 24th and when they reached advance base camp, they were stunt by the sight of it; ABC was completely buried under debris. Avalanche buried all climbing equipment of team and they certainly cannot climb with the gear, they are digging to find gear but not help so far except few broken tents. They have asked volunteers to dig with them on July 25th but look very hard. Even if they dig out equipment most of it would be broken. Dawa Sherpa who is leader of expedition allowed them to give it a try with available sources or else they go home. Seven Summits can still figure out a way but things don’t look good. K2 ABC buried under avalanche. 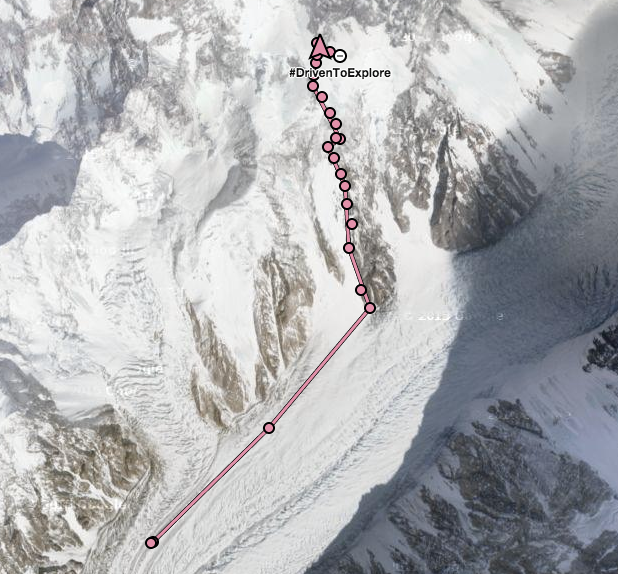 If Seven Summits end expedition, Madison Mountaineering will be only large team left on the Abruzzi Spur with a small team Karakorum Expeditions and Himex is already left alone on Cessen route. Avalanche has destroyed route from ABC to Camp 1 and also damaged rope. Madison team will have to put a lot of effort on fixing route again, and there is still no rope from c3 to c4. I sent an email to Vanessa O’Brien (British-American lady climber, she is part of Madison team) to inquire about their summit plans, and how things are going in the base camp. She was kind enough to reply me back on July 23rd. She further added that we are doing well and motivation is high for the summit, and we will wait for weather window (which can be in first week of August). Three Chileans climbed Gasherbrum II on July 24th, which makes 11 summits on the mountain this year: Polish climber Kinga and her porter, 4 members of K&P team and their two porters, and three Chileans. Spanish climbers started summit push on July 24th, they were seen high on the mountain from the base camp but they were moving really slow and they possibly returned without reaching the summit (there is no update from the team). Many teams were suppose to start summit push tonight, a large commercial team lead by Julian Beermann started summit push around midnight, after few hours he sent this message: “return due to snow conditions.” They are in the camp 3 right now, I will keep updating on progress of teams.